The Good Food Ireland 4th annual awards ceremony took place November 15th in Dublin’s Shelbourne Hotel. Members of the Good Food Ireland organisation were honored for their achievements and commitment to supporting Irish food and for being the ‘best of their types’. Over 250 key representatives from the food and tourism sectors including chefs, restaurateurs, hoteliers, farmers, fishermen and food producers from the four corners of Ireland were in attendance at the highly respected industry ceremony. Guest of honor for the evening was T.D. 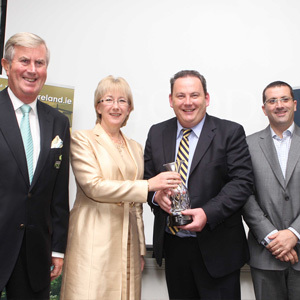 Minister for Tourism, Culture and Sport, Mary Hanafin, who presented over 16 awards to members along with Founder of Good Food Ireland, Margaret Jeffares and Chairman, Redmond O’Donoghue. Guests and leading industry figures enjoyed a fabulous dinner, which included fresh produce from a select number of Good Food Ireland artisan producers. Many famous faces from the foodie world stepped out last night to lend their support to Good Food Ireland, such as Myles Mcweeney, Hugo Arnold, Darina Allen and Ernie Whalley. Founder and Managing Director of Good Food Ireland Margaret Jeffares comments, “The objective of the awards is to promote the philosophy of Good Food Ireland members in offering a high quality food experience by being the “best of their type” and in their commitment to supporting Irish farmers, fishermen and food producers. The awards are based on consumer nominations over the last 12-month period and an independent judging panel of six quality assurance representatives”. Good Food Ireland is the only all island organisation that brings together a network of like-minded, people across all sectors of the hospitality and food industry.